Enjoy you stay in Britannia. 1. Votes to lynch a person must be in bold or they won't be counted. This is to make votes official and prevent confusion from people making arguments. unvote the username in bold and then vote the username of the new person you would like to lynch in bold. be lynched at the end of the day. change your vote, from which point you will be able to talk again. continues to apply after you're killed and until the game is over. know if you're PMing about this game, but it's not advisable for your sake either. You never know who you can trust. 6. Only current players may post in this game. Others/The deceased will have to wait until the next round. the Hosts beforehand if you are going to do this). choice may be made,or no choice may be made, depending on your role. particular role does not submit a night choice by deadline. commitment to the other players and contribute regularly. in good fun) will not be tolerated. 12. The game will begin with DAY, so that everyone has a chance to play at least a little. for lynching or no lynching. 13. If you have any questions, LET ME KNOW ASAP, ESPECIALLY IF YOU HAVE BEEN GIVEN AN IMPORTANT ROLE OR HAVE NIGHT ACTIONS. 14. Just to be sure you have read the rules, answer the following question in your first post, "I'm going to buy a car soon, what should I get?" Roles are assigned randomly meh. Have a good game everyone! You should buy a honda. How is everyone doing? Thoughts on the game? havent seen the show but ive seen fanart and cosplays of the show i think...im told the show is basically death note + gundam? 7 player game should be interesting, hopefully with just active players it should be a better game. Its not what car you should get, its what car you can afford... Toyota's are good, last long, cheap to maintain. 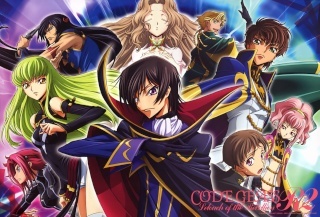 Code Geass was boring for me too... didn't get past episode 1..
dont know much about the theme, but with such a small group we probably only have 1 maybe 2 i guess. question to the mod, is there a time limit for day one? what if it isnt the first season that the game is based on? You should save earth's valuable non-renewable resources and get a bicycle. Errrr seeing theres only 7 players.... I think there will be 2 mafias at the very most? But lets wait for all players to post first. only third party being present probably a survivor i guess. townie, doest particularly inspire trust in your allegiance? @Nox Noctis & Stebung - Since this round is a smaller game and most of the players are useful/good, what are some other criteria do you think we can look at if we need to break the Day One stalement, seeing as we cant just lynch off the least active player to get the day rolling like we usually do? @Everyone - Haivng played multiple games with everyone, how do you rank each player (including yourself) as a threat/looking out for and try to be honest, dont suger coat your answers. Anyway, i consider myself a useful and resourceful person when i play properly. Plus, every game is different in itself. In that game i was unlynchable and a lot of people were inactive, which lead me to boredom and lynching you cuz its more fun, since nothing was happening. This game, is filled with people who aren't bad at mafia.so it will be different. That being said, everyone is quite a threat this round. there's no one who is inhereently NOT a threat present. I think we should get rid of ppl or watch out for the ones that are a bit too helpful. Since everyone here is more or less 'experienced' players, I don't believe that inactives are necessary 'bad'. I don't think there will be that many inactive players for this round. And we are taking a 5/7 or 6/7 chance of lynching a townie if we lynch the inactive. That being said if we lynch randomly today it'll be that probability of lynching a townie. So I think it's better to tread carefully since there won't be that many day phases for this game. Criteria..... can't really say yet. Everyone is posting so carefully. im thinking considering its such a small game, that there probably arent that many power roles in the game, perhaps something like 2 mafia, a normal one and a godfather. as for the town, im thinking 5 townies, with maybe just 1 power role, either cop/doc/vig i would say. i have to agree with this, when i came back and read the posts and seeing you lynch TIG i was like yay but wtf, you lynched your own comrade :S every game may be different, but it kind of set precedent as to how you played more of a "me" rather than a "team" game, which as a townie wont really work, since we have to work together if we want to win. Based on PAST experiences dude. Spill the beans now!! really work, since we have to work together if we want to win. i hope that the game is well balanced and fun, but considering that he hasnt played that many games and i wonder if he even knows how to set up/mod a game properly i think the game may end up being a bit lopsided or huge mess. though i hope im wrong and this game turns out to be fun. @TIG how come you asked nox and stebung the same question? Because maybe I couldn't be fucked logging in since she was already on the forum? I posted in her account so regardless who 'posted' it it was still me doing the typing. @reznor every game is different, obviously last game noone was taking it seriously. I wouldnt base any assumptions on that game lol. Im tempted to just lynch "Beiber Forever" cause i really really cant stand Justin Beiber and i really really do not want to continue this game typing out "Beiber Forever" 10 million times..
only because he has played less games than all of us :S where is your ranking list? if i really must make a list then.. In order from most 'suspicious' to least 'suspicious'. Nox Noctis wrote: if i really must make a list then..
1) A past game is a past game. Every game has its own different setups, individual approaches and outcomes. Using the facts of how i approached a game from 1 of the 19 rounds i've played isn't really a strong basis to imply im not trustworthy. How settled are you on lynching me Reznor?? Bieber Forever wrote: 1) A past game is a past game. Every game has its own different setups, individual approaches and outcomes. Using the facts of how i approached a game from 1 of the 19 rounds i've played isn't really a strong basis to imply im not trustworthy. Bieber Forever wrote: How settled are you on lynching me Reznor?? Idlefingers wrote: @TIG how come you asked nox and stebung the same question? Honest answer? I didnt have anything to ask Nox, so i just gave her the same question as Stebung. Just trying to incite discussion and talking or else people would mostly be waiting for someone else to do something. Possibly find something we can use to keep the day moving along till we decide upon a lynch. Other people need to pull their weight as well. So id like to hear some possible things we can do to change this and get everyone more involved. Considering this is basically the best of the best for the most part, im sure we could come up with something new that could work rather than "lets go with what TIG says"
Additional point to consider, considering the theme and who the mod is...im starting to think that this game may be overloaded with power roles what are peoples thoughts on that being the likely case? I personally dont even know if the mod is actual still checking up on the game :S.
Its a game with 7 people, its been a while since ive played a round with so little ppl..
Hmmm do you have any reason to belive that this game would be really imbalanced?? @Reznor and Stebung, how concerned are you that this might be inbalanced. As in, there's too many people who are overpowered as an example?? Bieber Forever wrote: @Reznor and Stebung, how concerned are you that this might be inbalanced. As in, there's too many people who are overpowered as an example?? I don't think that will be the case. If it's theres power roles everywhere don't you think the game will end too soon? Then again it's Snowy hosting I dunno if he's gonna spam power on everyone. I just think.... it's unlikely to have too many power roles in a game this size. Mafia can kill, town probably has a doctor and a cop. That should be about it. Yes you may be right there. Most of you are in one big stalemate. I guess I'll put a time limit if things don't change in the next 24 hours. @mod What if its a Tie vote? Ok if thats the way your gonna make it, then I'll just lynch the person at the top of my suspicious/threat list. @ Everyone. Was going to impose a time limit after 24 hours if no new lynching happened but it looks like there is no need for that now. Guess thats that was 1 of 2 options really at this stage since sKeam would have just voted for Reznor in any case. It would have come down to either Stebung or I to make the choice on which way the lynch went.